With a new CTA "smart" card debuting next week that allows riders to add money through their credit cards, the Chicago Transit Authority is moving a step closer to a fare system where cash is rarely used. Experts said the move knocks down another barrier to creation of a universal transportation card that would help unify Chicago-area mass transit. Such a card would also be used to pay for Amtrak and airline tickets, taxi and limousine rides and tolls on the Illinois tollway system. The Chicago Card Plus, which is costing the CTA about $1 million to roll out, is designed to lower internal costs--potentially helping postpone the next fare increase--and speed bus and rail service by boarding passengers more quickly. The Plus card will work as either a 30-day unlimited ride pass, which sells for $75, or a pay-per-use pass on CTA buses and trains and Pace buses. Cash fares will still be accepted, but the CTA is offering incentives for riders to use the new card. Cash makes up only 16 percent of all fares, and the agency would ultimately like to bring that figure down to 1 percent. A reduced-fare Plus card won't be available until later this year to senior citizens, students and disabled riders, officials said. They can continue to use their reduced-fare passes and still receive a 10 percent bonus for prebuying multiple rides, officials said. Sign-up for the cards starts at 9 a.m. Monday. CTA officials said it would take several days to process the requests and mail the cards. The existing Chicago Card smart card and the new Plus card, which will be available free through March 31, will cost $5 starting April 1. Pay-per-use patrons can authorize credit-card payments in $10, $20, $40 or $60 increments and check account balances on-line, similar to the tollway's I-PASS toll-collection system. Charges are made automatically on the credit card when account balances fall below $10. Users would receive a $1 bonus for every $10 of added value, officials said. Companies and employees enrolled in the RTA/CTA Transit Benefit program will be able to sign up next week for the Plus card and receive the cards starting April 1. The CTA will mail the Plus card to employees in the Transit Benefit program, which is a payroll-deduction program that shields up to $100 in income monthly from taxes. Like the current Chicago Card smart card, the Chicago Card Plus will contain a tiny computer chip that enables riders to pay fares by touching the card--or a wallet holding the card--against an electronic reader on bus fare boxes or turnstile devices at rail stations. Value will still be added to Chicago Cards at CTA vending machines. The Chicago Card Plus will be reloaded strictly by credit-card accounts. Either way, CTA president Frank Kruesi said the fare-collection process takes .3 second with the smart cards, versus 2 seconds inserting and withdrawing a regular magnetic strip transit card into a slot and considerably longer to count and deposit the correct cash fare. Increased use of the smart cards, which currently account for only 1 percent of fare transactions, is expected to be a particular time-saver on heavily used bus routes,where buses get bunched in one area, leaving passengers on the route waiting long periods. "I've been in plenty of lines at rush hour, where you will see 15, 20 people or more waiting to get on a bus," Kruesi said. 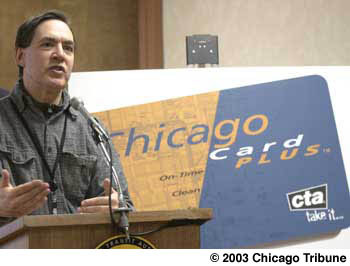 Kruesi said there are no immediate plans to eliminate the Chicago Card or the CTA magnetic transit card. But after March 31, the CTA will no longer pay magnetic-card customers a 10 percent bonus for buying at least $10 in fares. A key goal of the smart technology is to get cash fares, which are the most expensive to process and are vulnerable to internal theft, down to about 1 percent of all fares paid, officials said. The technology in the Chicago and Chicago Plus cards makes it possible to program equipment to deduct the correct $1.50 base fare on Pace, the $1.75 base fare on CTA and the distance-based fare on Metra. "Eight to 10 years from now, there will probably be a single-payment medium in our wallets, along with some cash, to pay for all this stuff," said David Schulz, executive director of the Infrastructure Technology Institute at Northwestern University. "It won't be like a bar code tattooed to our foreheads, but we will use it to ride transit buses and trains, Amtrak, limousines and United Airlines, if they are still in business."